Our chess piece and board are easily located in various places and easily carried. 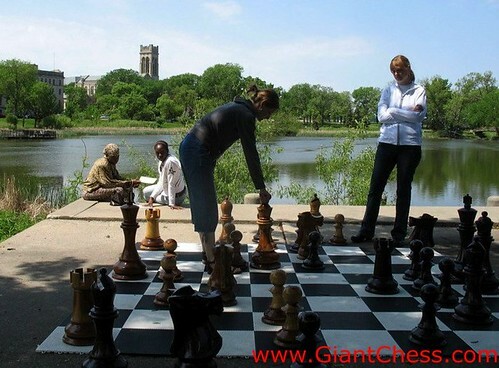 In your leisure and holiday, giant chess will be a good companion. As seen in the picture, playing giant chess beside a poolgives you memorable summer holiday. Chess has been perceived as difficult and serious board game. However, it does not mean that you cannot play it outdoor. Giant chess will add fun into the game in this holiday season. Placed at your favorit place, you will have a valuable holiday with your friends, family and children. Get the best quality of wooden giant chess from our store. We produce it carefully for outdoor use and durable in any seasons. It has made of the best quality of Teak wood and polished well. So you do not need worry about its durable. We give you the best quality of wooden chess product.